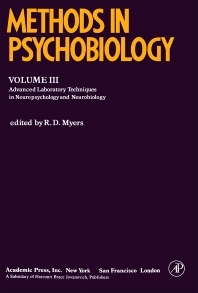 Methods in Psychobiology, Volume 3, Advanced Laboratory Techniques in Neuropsychology and Neurobiology is devoted in large measure to specialized techniques that are widely used in the fields of psychobiology and neurobiology. The experimental methods described form a companion to those presented in Volumes 1 and 2. Many of the procedures presented hinge directly on a mastery of the more rudimentary techniques dealt with in the earlier volumes. The emphasis in the content of this book is on one facet of neurobiology, the mammalian central nervous system. The central or peripheral processes that affect this system in a rat or larger laboratory animal constitute the principal focus of this series. This is due in large part to the enormous amount of research carried out with higher species and the generalizations that, it is hoped, may be drawn to the nervous system of the human. Topics discussed include neuronal connectivity; chemical lesioning of indoleamine pathways; evaluating sensation in animals after lesions, treatment with drugs, electrical stimulation, cooling, or radical changes in environment or development; and sleep in animals.